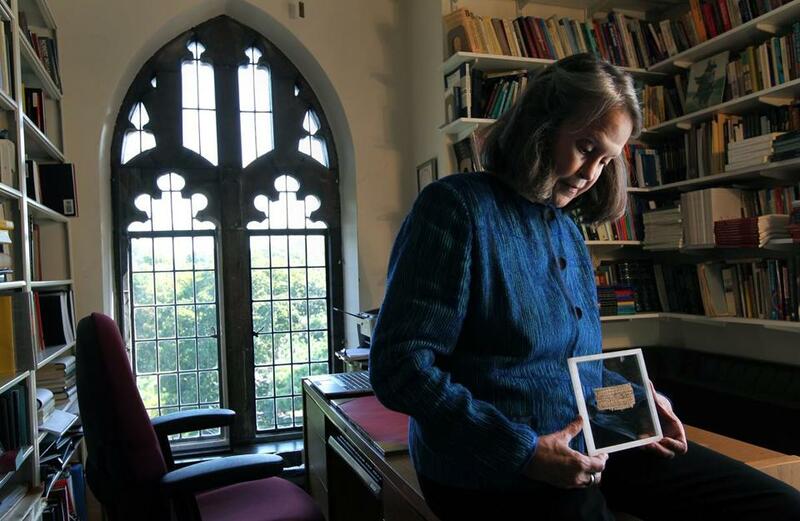 Karen L. King, Hollis Professor of Divinity at Harvard University, in her office with a papyrus fragment. A week after Harvard professor Karen L. King announced she had identified what she believed to be a fourth-century fragment of papyrus portraying Jesus as married, her finding continues to generate sharp debate — and significant skepticism — in academic circles. The news was arguably the biggest story regarding early Christian history in recent memory and generated a massive response, from obscure biblical blogs to late night television and Twitter. Some scholars appear to be biding their time before weighing in. But so far — aside from the academics who contributed to King’s initial research, including one of the world’s leading ­papyrologists — no prominent scholar has yet offered a strong endorsement of the fragment’s authenticity. Several top Coptic specialists dismissed the fragment as a probable forgery almost immediately after King’s presentation at a major gathering of scholars in Rome. And a British New Testament scholar, Francis Watson, posted several short papers online during the last week arguing — persuasively, to some in the field — that the fragment’s text is probably a modern forger’s pastiche of words and phrases taken from the single surviving copy of the Gospel of Thomas. “My view is, the jury is out still, but it’s not looking good for authenticity,” said Bart Ehrman, a New Testament scholar and professor at the University of North Carolina at Chapel Hill. King, a Divinity School professor who has said all along that she is open to the possibility that the fragment could be a forgery, said in a phone interview Wednesday that she is not concerned about the lack of full-throated support from colleagues. Malcolm Choat, a professor of ancient history at Macquarie University in Australia, said in an e-mail that he was reluctant to weigh in because he had not seen the papyrus. He noted that Roger S. Bagnall, director of the Institute for the Study of the Ancient World in New York and a top papyrologist whose name carries great weight in the field, has said he believes it is probably genuine. At first glance, though, the script looked “a bit odd” to ­Choat and the dating is “by no means certain,” he said. Continued examination and scientific testing are in order, he said, as well as a more detailed investigation of the fragment’s origins. “Only then can we be more certain that it is genuine,” he said. In mid-October, Harvard’s Straus Center for Conservation and Technical Studies plans to test the chemical composition of the ink, King said. That may shed light on whether it ­includes substances not available to ancient scribes. The papyrus will also undergo carbon-14 dating. But because it is possible that a modern forger could have obtained a blank piece of ancient papyrus and applied ink in recent times, that test will not determine when the text was written. The ink will not undergo separate carbon dating, King has said, because it would require removing so much ink that the fragment, a bit smaller than a business card, could be destroyed. Some papyrologists maintain that King should have tried harder to determine the origin of the fragment, which is owned by a private collector who King says wishes to remain anonymous and who professes to know little about where it was found. King has argued that the fragment is a translation of a second-century Greek text that echoes the Gospels of Thomas, Mary and Philip and is part of a discussion among Christians of the period about marriage and celibacy. But Watson, a New Testament scholar at Durham University in England, argued in several brief papers over the last week that the fragment is entirely derived from the Gospel of Thomas. Of particular concern, he writes, is the beginning of the first line, which is identical to the start of a line in the only surviving copy of Thomas. Modern editions of Thomas, which are widely available, include the Coptic with the original line breaks. Stephen Davis, a professor of religious studies at Yale University, said his cursory reading of Watson’s argument did not seem to rule out authenticity. Mark Goodacre, a New Testament scholar at Duke University who posted Watson’s ­papers on his blog, said that while King is a cautious, careful scholar who is “massively respected in the scholarly guild,” he found Watson’s arguments persuasive. Although King provocatively named the fragment “the Gospel of Jesus’s Wife” — an act that also provoked criticism in some quarters, because it’s unclear what the fragment was originally part of — King has repeat­edly emphasized that the fragment does not shed new light on the marital status of the historical Jesus. The New Testament gospels, which scholars generally agree are the earliest and best source of information about Jesus’s life, are ­silent on the issue.